Bermondsey is a riverside settlement to the east of Southwark. 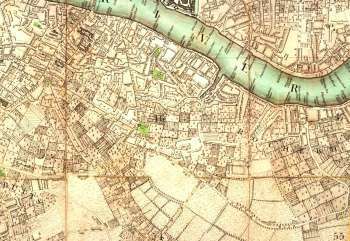 It has the same geographic origin as its larger neighbour Southwark – its centre, the site of the modern Bermondsey Square, was a sand and gravel island that rose slightly above the surrounding marsh. Indeed this feature is reflected in the meaning of the name: ‘Beromund’s island’. At the heart of the town was a Cluniac priory (later elevated to an abbey) which stood at the junction of the modern Abbey Street and Long Lane with Tower Bridge Road; it was dissolved at the Reformation and none of its fabric survives. In the 17th and 18th centuries a few grand houses, such as Abbey House, adjacent to the church, were built and Bermondsey was briefly a desirable place to live; it even had its own spa. Even then it was also a place of industry, and this came to dominate the area in later years. Bermondsey evolved into an industrial centre in the 18th and 19th centuries. Its principal activities were riverside wharves where imported goods, especially foodstuffs, were landed; food processing; and tanning and leather working. Butler’s Wharf dominated the wharf trade and Peek, Frean & Co. was probably the best known food processor. Tanning pits, where skins were soaked in a succession of unpalatable organic substances, were a distinctive feature of the area. Much of the work in these activities was casual and unskilled. The earliest areas to develop were near the river – such as Jacob’s Island, just to the east of St Saviour’s Dock, a notorious and appalling slum – and along Bermondsey Street. Grange Road has a series of Georgian houses, but in the early Victorian period there was much building of small terraces around Grange Road, and there was a second phase of development in the later Victorian period of larger houses along Southwark Park Road and Lynton Road. By 1900 Bermondsey’s population was all working class, but ranged from the almost destitute casual worker to skilled Thames watermen and lightermen. In general, Bermondsey’s 19th and early 20th century residents also worked there, making it a self-contained area, not a suburb. Much of the housing was sub-standard; in the early 20th century the Bermondsey Borough Council – noted for its progressive bent – carried out extensive slum clearance and other social reforms. Their work is still fondly remembered even today. This map, printed in 1787, shows Bermondsey before its suburban development. The map is not easy to read unless enlarged (click here for a readable version), as the symbols used to depict trees and market gardens can easily be confused with buildings. Recently built turnpikes are in evidence on Greenwich (now Old Kent) Road and Blue Anchor (now Southwark Park) Road. New roads have also been built: the first section of (Bermondsey) New Road, which later became (Old) Jamaica Road, and what is now Dunton Road. Tanning is a prominent industry and the ditches and streams that supported this activity are evident near Neckinger and just west of St Saviours Dock. 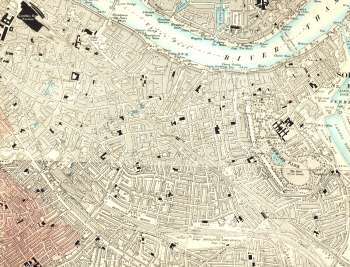 The second map shows Bermondsey in 1846 in the early stages of its urban and suburban development. The built environment is as much an industrial as a residential landscape. Warehouses and wharves line the river and amongst the fields are tan yards and rope walks. 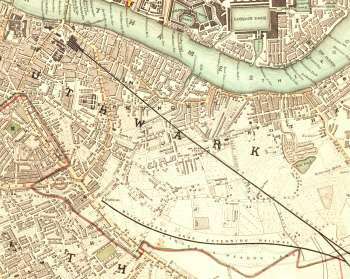 Two railways cut through the area: the London Greenwich and the Bricklayer Arms Extension, the latter carrying passengers only until 1852. Click on the map to enlarge, or click here for a readable version (slower download). The third map shows Bermondsey at its most intensely urban. It is a landscape of warehouses and wharves near the river and densely packed housing further inland. The density is relieved by Southwark Park, London's first municipal park opened in 1868, the Bricklayer's Arms goods railway and a small area of better than average housing near Fort Road, north-east of Bricklayer's Arms.